Bobby Jindal has decided to run for president, so let’s do another candidate evaluation. I’ll be evaluating Jindal’s background, policy history, and explicit statements to determine whether or not he would make a good president. I won’t be paying attention to electability or likeability, as is often common elsewhere on the web. Jindal has a BA from Brown dual-majoring in biology and public policy. He did a master’s degree in political science at Oxford, and turned down an offer to do a doctorate there. This makes him the only 2016 candidate with a graduate degree in a major social science field. He converted to Christianity in high school. In 1996, he was appointed Secretary of the Louisiana Department of Health, where he eliminated the state’s medicaid deficit. In 2001, President Bush appointed him Assistant Secretary of Health and Human Services for Planning and Evaluation. He served for two years before resigning to run for governor of Louisiana in 2003. He lost to Kathleen Babineaux by a narrow margin. He was elected to the House of Representatives in 2004 and reelected in 2006. Both times, he won by immense margins. In 2007, he tried for governor again, and this time he won easily. He was reelected in 2011 by an even larger margin. At the time of writing, he is still the sitting governor of Louisiana. Jindal is the second candidate to have served both in congress and as a governor (the other is Lincoln Chafee). This means we can look both at his voting record and his record as governor. He supported President Bush’s 2005 effort to privatize social security. He voted against stem cell research and had a 100% rating from the National Right to Life Committee. He voted for a constitutional amendment against gay marriage in 2006. He has the same position in 2015. He got a 0% rating from Americans United for Separation of Church and State. He voted for a border fence in 2006 and earned a 100% rating from US Border Control, an organization that advocates for a sealed border and opposes a path to citizenship. He got a 0% rating from Citizens for Tax Justice, which promotes progressive tax policies. He voted against net neutrality in 2006. He voted in support the Iraq War. President Bush made absolutely the right decision. Let’s remember, the world is a better place without Saddam Hussein. Tell that to the Iraqis hiding from ISIS. In 2008, Louisiana’s per capita income was 92.6% of the average. In 2013, it had slid back just a tad to 92.1%. 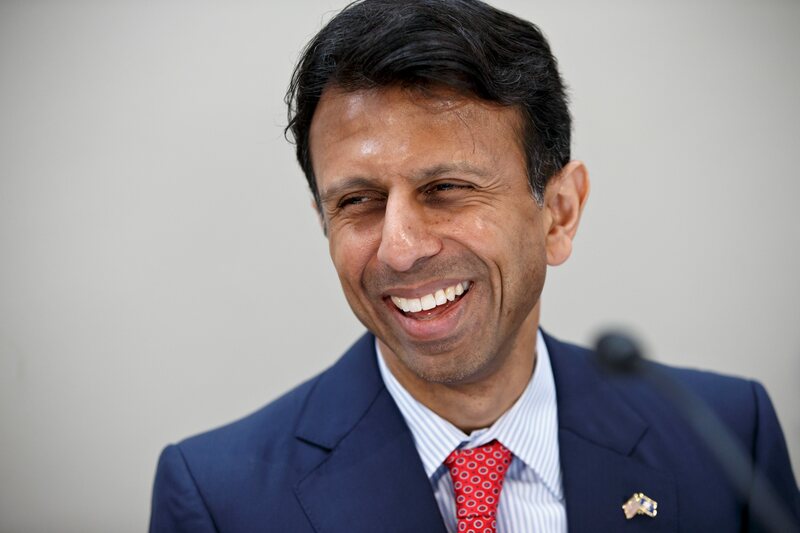 Suffice it to say, Jindal has not achieved an economic miracle. Louisiana also has the second highest poverty rate in the country. 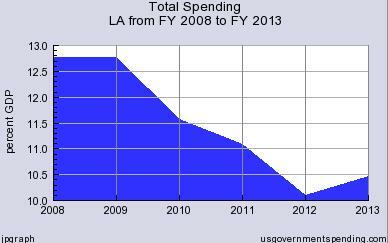 The cut is more than two points of GDP in total, with two years in which Jindal cut spending by more than 1 GDP point. 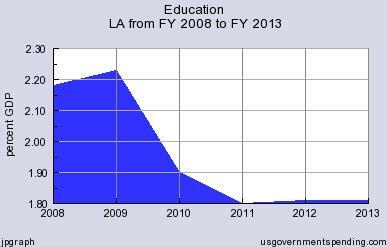 Based on the IMF data, this certainly cost Louisiana significant amounts of economic growth. But you know what’s really disturbing about all of this? When Jindal became governor in 2008, Louisiana had a $1 billion surplus. Today it has a $1.6 billion deficit. How did this happen? Instead of using stimulus spending to boost the Louisiana economy during the 2008 crisis, Jindal responded with the largest tax cut in state history. The cuts overwhelmingly targeted those at the top of the distribution. In an economy depressed by sluggish demand, firms have little reason to spend any additional money they receive from investors. If there’s no demand for new products, there’s no reason to expand capacity. So the money sits idly and does the economy no substantive good. Louisiana needs to reverse course, but because Jindal has presidential ambitions and has signed Grover Norquist’s infamous anti-tax pledge, he has vowed to block all tax increases. None of this has stopped the Cato Institute from heaping praise on Jindal, but we should not be surprised–Cato (formerly known as the Charles Koch Institute) is infamous for only caring about tax cuts for the rich. Cato doesn’t care that Louisiana’s budget is a blasted ruin, or that its public services are crashing and burning. I’ve looked at a lot of candidates who were governors. Jindal has the worst record, without a doubt. He supports a balanced budget amendment, which would destroy the federal government’s ability to respond to serious economic crises. He calls climate change a “Trojan Horse” and wants to reduce the EPA’s ability to regulate emissions. He falsely claimed that there are no-go zones in London for non-Muslims. Given that he’s an Oxford graduate and has lived in the country, this is just embarrassing. He has a reactionary alternative to Obamacare that would privatize medicaid and medicare, ignoring the reality that these programs are more cost-effective than private insurance. The plan also calls for granting health insurance to people with pre-existing conditions without providing for an individual mandate–this would make Jindal’s plan unaffordable for insurance companies, which depend on a large pool of healthy individuals to make a profit. In each of these cases, Jindal’s solution is simply to have the state subsidize private sector coverage, which only creates incentives for doctors and hospitals to raise prices further. 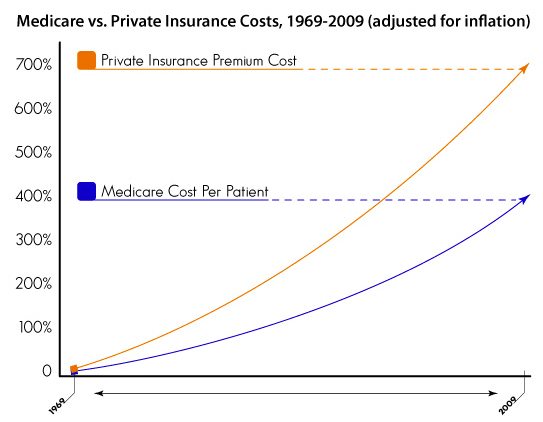 Medicare also outperforms private insurance on patient satisfaction and access to care. His attacks on medicaid also unfairly compare medicaid patients to the entire distribution of private sector patients, when in reality medicaid patients are only really comparable to private sector patients at similar income levels. Once you adjust for that disparity, the research indicates that medicaid patients are less likely to be underinsured than those at the low end of the private insurance scale. Bobby Jindal is a miserable governor and he’d make a miserable president. I can find no redeeming features. He’s one of the worst candidates I’ve looked at. He practically spent the last 7 years raiding the Louisiana treasury and handing all the money to his rich friends while the state burned. More than that. Given his record in public office, Oxford should be embarrassed they admitted him as a student.